Al has spoken to thousands of people across the world! Al’ talk at Made in Space in Copenhagen! Al was invited to speak at the Made in Space festival in Copenhagen to share his work around ‘cultural architecture’ and the art of facilitating vulnerability as we move to creating more open and communal living and working spaces. Al’s first TEDx talk in Colorado! 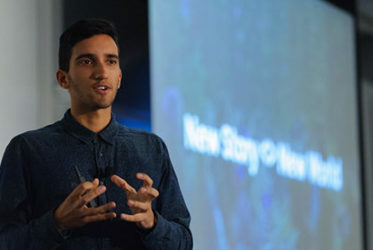 Al was invited with 3 weeks notice to present his vision to over 4000 people at TEDxYouth Mile High in Denver, Colorado in 2014. Since then Al has been invited to share his insight and message around regenerative community, future of living and human performance to groups of people worldwide. 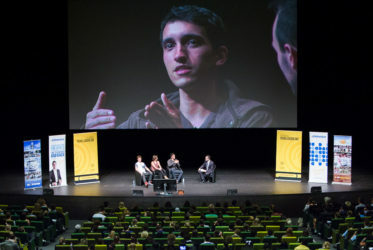 One of very few keynote speakers in Australia able to relate strongly to both youth and executive teams with ease. Al’s keynotes are always high-energy, story-based and outcome-orientated. He expertly tempers powerful content with a balance of warmth and humour. Al’s presentations are dynamic and participatory. He engages audiences with an array of ‘hands on, minds on’ activities to get them integrating conceptual knowledge straight away. With the millennial generation expecting and demanding radically new working conditions to what most workplaces can offer, how can you adapt to become attractive to this rising talent pool that will fuel the creativity and energy of your organisation? How do you create a place that bridges gaps across generations and propels your team into creative progress? 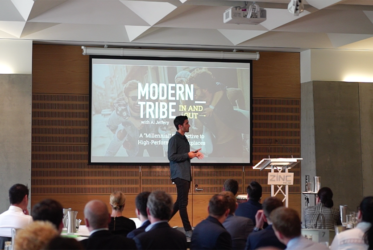 After travelling globally and running intimate events with youth and millennials around the world, Al shares the key insights into the behaviours of this generation and what the cultures and spaces look like that allow them to perform at their best. Based on insights into human behaviour, neuroscience, “flow states,” and social ecology, Al will share practical examples of what this culture might look like within your specific organisation, providing real case studies and examples. He understands culture management and that change is not easy, and so expect tangible and realistic actions that you can implement after leaving the room. Based on a 10 year study by McKinsey showing that executives perform 5x better when in a “flow state,” understanding flow states is vital for productivity and creativity in any team! As companies realise that the real key to unlocking a thriving company both economically and socially is the people and their development, creating a culture and environment that engineers “flow” for the team is something Google, Apple, Facebook and the world’s leading organisations are paying a lot of attention to! There are 17 core triggers (3 environmental, 4 psychological, 8 social, 2 creative triggers) that lead to a “flow state” both personally and in a team environment. Al will explore all of these triggers through stories and relative examples based on your organisation. We are entering the ideas age! Technology and access to information and resources is becoming democratised, ubiquitous and open-source. The new leading edge is how we organise this into new ideas that matter. Companies like IDEO and many other design agencies specialise in idea generation every day. There is also the new emerging generation of the DIY Innovator, empowered to think freely, and act openly with their teams. However, this takes a certain culture to allow this. The old closed, secular and hierarchical models will not promote or allow the free-flow of ideas and innovation from within an organisation. In this talk, Al explores what the physical space, cultural space and internal habits, rituals or initiatives might look like that will create the space for ideas to flow freely and be nurtured. Preparing for 21st Century careers: Entrepreneurship, soft skills and making your mark! The job marketplace is changing quickly. As the needs of the market change and as organisations look for different skills and competencies in their talent in order to meet new challenges, we need to be aware of how we can develop this new set of abilities in order to differentiate and position ourselves. New types of organisations are emerging; social enterprises and collaborative enterprises. Both of these call for soft-skills that haven’t been so important ever before. [Audio] Speaking on a “Resilient Cities and Young Innovators” Panel at Vivid Sydney, 2016.